Transparency Market Research has recently published a new market research report, titled ‘Minimally Invasive Vertebral Compression Fracture Repair Market - Global Industry Analysis, Size, Share, Growth, Trends and Forecast, 2013 - 2019’, which has been added to its huge database of market research reports. This study report provides a complete market overview including the current market scenario and future market trends, market drivers and restraints, and several opportunities in terms of technological innovations and additional uses of minimally invasive vertebral compression fracture products in the medical industry. For regional analysis, it provides the market size and forecast for four regional segments of the market, namely North America, Europe, Asia-Pacific and Rest of the World (RoW). Vertebral compression fracture (VCF) is the collapse of the vertebrae caused due to osteoporosis, trauma, or other causes of weakening of the vertebrae. A vertebral compression fracture is typically treated with prolonged bed rest and pharmacological therapy. However, surgically, VCF is treated with minimally invasive VCF repair techniques. VCF products and techniques are effective in times where medicinal therapies fail to cure VCF. Owing to such benefits, analysts at TMR predict that the global market for vertebroplasty and kyphoplasty devices is estimated to reach a market value of US$2.82 bn by 2019 from a value of US$1.58 bn in 2012. The market is expected to grow at an 8.7% CAGR between 2013 and 2019. 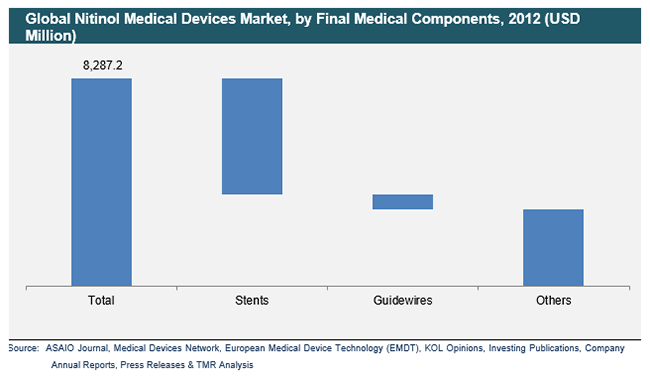 The international market for minimally invasive VCF repair is highly secure in nature and offers several growth opportunities in terms of technological advancements and reliability of surgical products. This market has only a handful of vendors that are well established and take up more than 80% of the overall global minimally invasive vertebral compression fracture repair market across the globe. Due to the existence of only a few market players in the market, there has been an intensive competitive rivalry among the players in the past few years. The high-intensity competition is expected to remain in the next few years. Minimally invasive vertebral compression repair techniques include two procedures: vertebroplasty and balloon kyphoplasty. Vertebroplasty is a procedure that involves direct percutaneous injection of bone cement on the vertebral fracture. This procedure helps in relieving pain and enhancing mobility in patients. On the other hand, kyphoplasty places an inflatable bone tamp into the fracture. It is an effective procedure that involves percutaneous cannulation of the vertebral fracture and helps in restoring the height of the deformed vertebrae. Although, both these procedures are effective - the rates of surgical complications are less than 2% for osteoporotic VCFs, and nearly 10% for VCFs due to malignant tumors the adoption rate of kyphoplasty procedures is higher in North America. Kyphoplasty procedures have more advantages over vertebroplasty and thus, will be highly preferred in the future. They offer significant and sustained improvement in quality of life, mobility, and reduce back pain more effectively. The market share of kyphoplasty procedures was worth US$555.4 mn in 2011 and is expected to increase rapidly until 2019. The report includes profiles of some of the major companies operating in the minimally invasive vertebral compression fracture repair market. They areZimmer Holdings, Cook Medical Inc., Medtronic Inc., DePuySynthes Inc., CareFusion Corporation, and DFine, Inc, among many others. A few of these players dominate the market for VCF fracture repair in Latin American countriessuch as Argentina, Brazil, and Mexico, especially in the supply of medical grade bone cement.